The Forest Growers Levy Trust (FGLT) is the largest industry funder of research and development for the New Zealand forest-growing sector. The New Zealand Forest Owners Association (FOA) represents the owners of New Zealand’s commercial plantation forests. Its members own or manage around two-thirds of the country’s 1.79 million hectares of plantation forest and are responsible for over 80% of the annual harvest. A levy is paid on each tonne of harvested timber. The FOA provides secretariat support to the FGLT, in conjunction with the NZ Farm Forestry Association (NZFFA), which represents small forest owners. 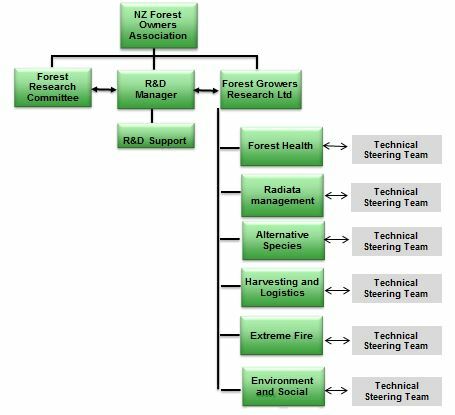 Forest Growers Research Ltd (FGR) is part of FOA, and manages the research programmes approved by the FGLT on the recommendation of the joint FOA/NZFFA Forest Research Committee. The Forest Research Committee makes recommendations on research priorities for funding based on the priorities set out in an industry Science and Innovation Plan. Once operational, each research programme is guided by a Technical Steering Team made up of industry representatives or other relevant experts. Some forest growing research programmes receive funding over and above the levy. Other major sources of funding include the Ministry of Business, Innovation and Employment (MBIE), the Ministry for Primary Industries (MPI), and government/industry partnerships via the primary growth partnership structure (PGP). A number of companies also contribute directly to forestry research. The programmes come under the umbrella of the Forest Growers Research management structure, ensuring good coordination across the full spectrum of research programmes.